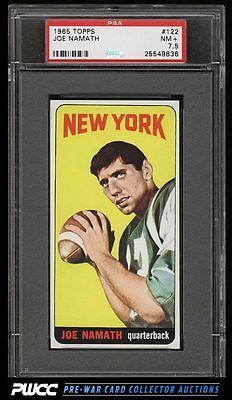 Absolutely stunning and altogether immaculate Namath RC which outshines many of the PSA 8s in the hobby. Completely fresh and bright from every angle with perfect print, chipless edges, and bright color. Very minor touches of wear at the extreme corner tips are all that downgrade. Compared to the $50k price tag of a PSA 8, this example seems like a steal at anything below that number. A beautiful card, recently assessed by PSA and comes with our highest recommendation. One of nearly 20,000 cards, lots, and sets up for bid in our 7th Auction of 2016. Click on the link above to view the other PWCC auction lots.